Secretly monitor what is being viewed on your computer while you are away. 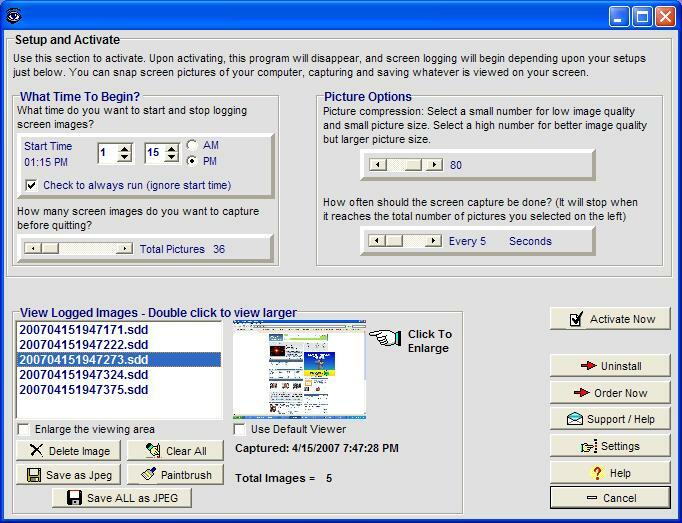 This software allows you to capture and save screen images while you are away from your computer, showing you exactly what was being viewed on your computer at specific intervals. PC Spy runs completely hidden in the background, and all captured screens are not viewable with any normal viewer, but only with PC Spy. (Runs on all Windows systems). ...... PC Spy runs completely hidden in the background, and all captured screenshots are only viewable with the PC Spy software. You simply select activate and how often you wish to capture the screenshots, and the software will begin working without any notice to the user. You can also set a start-time if you wish for the software to sit dormant and begin capturing only at a later time, and there is even a picture compression level you can set which allows you to save disk space on captured screens. This software can also be activated from a diskette or USB, leaving no trace of the software on the computer for anyone to get suspicious. (Runs on all Windows systems). Qweas is providing links to PC Spy 2.46b as a courtesy, and makes no representations regarding PC Spy or any other applications or any information related thereto. Any questions, complaints or claims regarding this application PC Spy 2.46b must be directed to the appropriate software vendor. You may click the publisher link of PC Spy on the top of this page to get more details about the vendor.